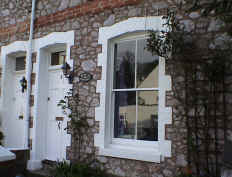 Rosalia Cottage is situated in the charming village of Wellswood in Torquay. It has been tastefully decorated and fully-equipped to provide you with a comfortable holiday home. Though in a peaceful mews road and conservation, Rosalia is only 1/2 minute walk from local shops and 5 minutes from many beaches and secluded coves. The locality includes designated heritage sights and the nearby heritage coast is served by many footpaths. Beautiful pine clad fitted kitchen, which is fully equipped with fan assisted oven, fridge with freezer compartment, microwave, washing machine, kettle, toaster, dinner service, iron, ironing board etc.